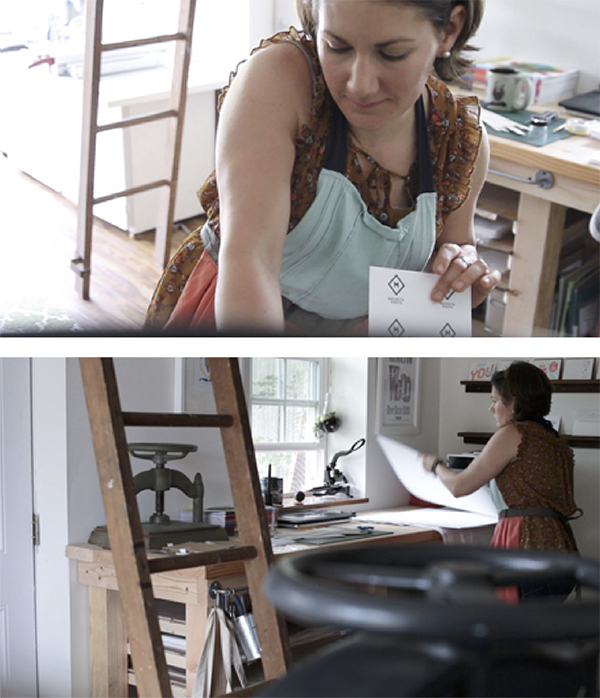 Connecticut-based Lourdes Irizarry of Slackline Press balances printing life with outdoor adventures in her garage-turned-printing haven. 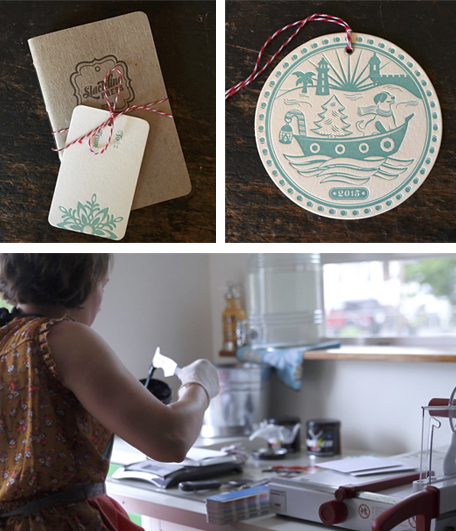 With her Golding Jobber press (which she rescued from dust-covered days), Lourdes enjoys creating punchy, colorful designs and incorporating her love of travel into her work. 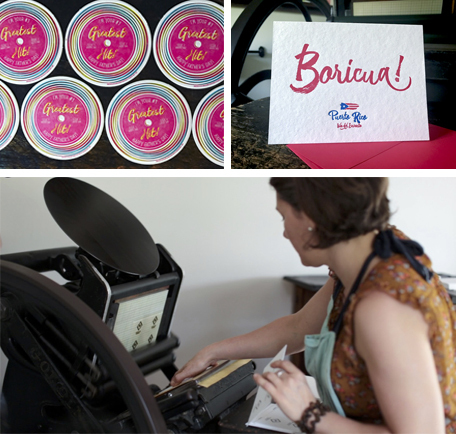 In our chat with Lourdes, topics flow from selecting the perfect paper for large solid jobs, to the allure of letterpress and sketching out her future line of wedding invitations. PRINTING PASSION My name is Lourdes. I’m a digital art director by day and run Slackline Press as a passion project for now. I was born and raised in Puerto Rico, lived in Orlando, Florida and now reside in Connecticut with my boyfriend and two dogs. 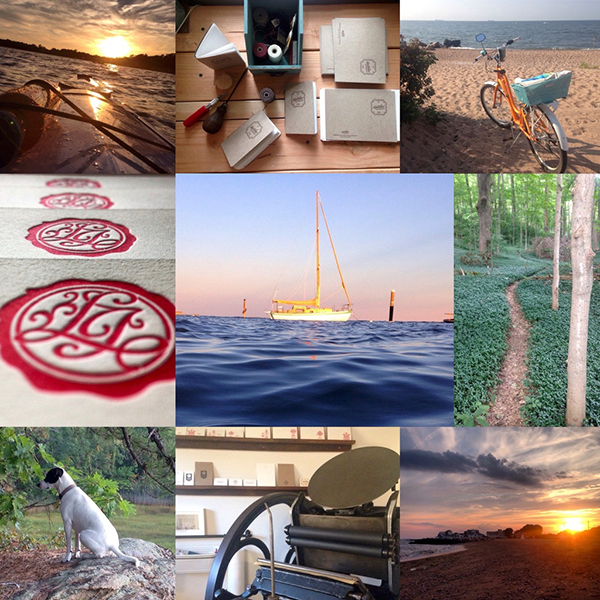 LOVE AT FIRST IMPRESSION I started my letterpress journey in 2013 as a creative outlet from my day job. 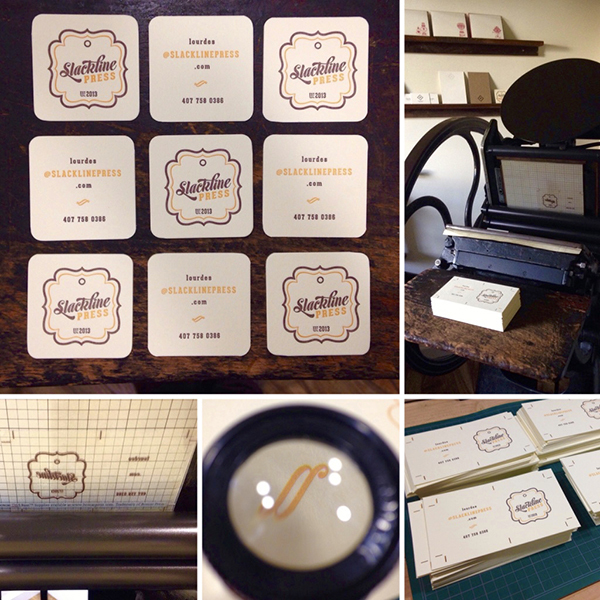 As a designer, I had always been interested in letterpress but had never looked into what it would take to get set up. After researching different types of presses, I decided a Golding Jobber or Pearl would be the right size for my studio and the type of work I wanted to create. I started poking around online and found a Golding expert in my area that did workshops. 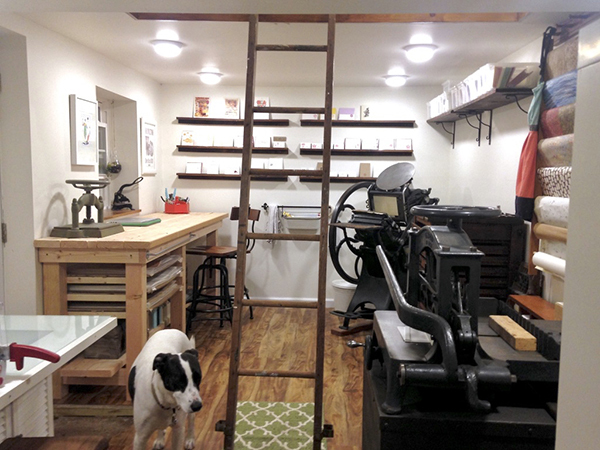 It was love at first sight and I immediately became obsessed with building a letterpress studio. CREATING IN CONNECTICUT My shop is in half of a detached garage behind our tiny cape on the CT shoreline. The detached garage was a selling point when we bought the house but it was in pretty rough shape. We hired a contractor who worked with my crazy vision of building a tiny loft in the crawlspace. It’s definitely my favorite thing about the space. It turned out way nicer than I ever would have imagined. SURROUNDED BY ADVENTURE I love that I can bike to the beach in our town. There are also a number of outdoor adventure opportunities in the area. Rivers for water sports, plenty of forested trails for hiking and letting the dogs run around as well as a number of quaint town greens with farmers markets, shops and restaurants. My favorite landmark is the shoreline trolley museum which renovates and runs old trolleys from East Haven to Branford. We’re also 1.5 hour train ride from New York City. PRINTING MENTORS Yes! John Falstrom of Perennial Designs connected us with our first press and offered an incredible amount of knowledge on the best way to move and renovate our Jobber. Also John Barrett of Letterpress Things whom I acquired my other 2 presses from. 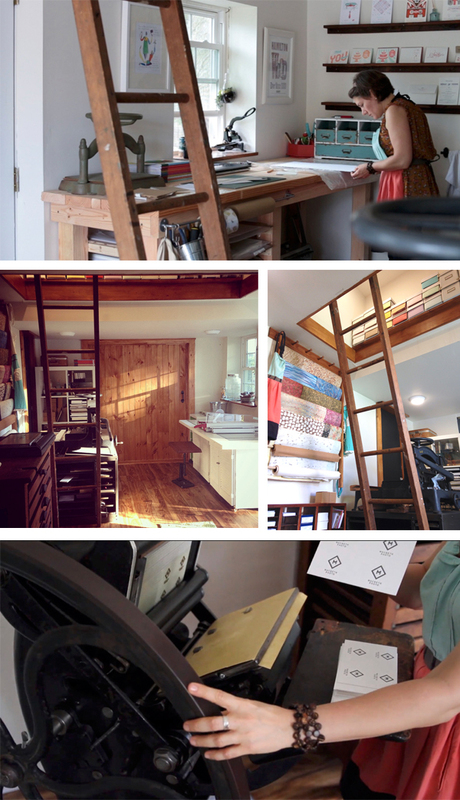 His warehouse is packed with supplies and letterpress ephemera. They are both a huge wealth of knowledge and are just wonderful people to know. Inspiration is everywhere in our surroundings but I’m particularly inspired by travel and culture. I am currently infatuated with Mediterranean patterns. PART TIME PRINTING, FULL TIME FUN I have a day job so I work my printmaking schedule around that. I’m still working out my long term goals for my letterpress business and figuring out the balance between custom work and my own stationery line. But I would love to build relationships with other crafters and artisans who need branded stationery or packaging. THE CREATIVE FLOW I always start with really rough thumbnail sketches on paper, on my iPad or just write down ideas. I then try to choose a few that I keep coming back to, develop the sketches a little further and then illustrate them in Adobe Illustrator. Lately I’ve been designing vector art on my iPad Pro to save time going from sketch to digital. 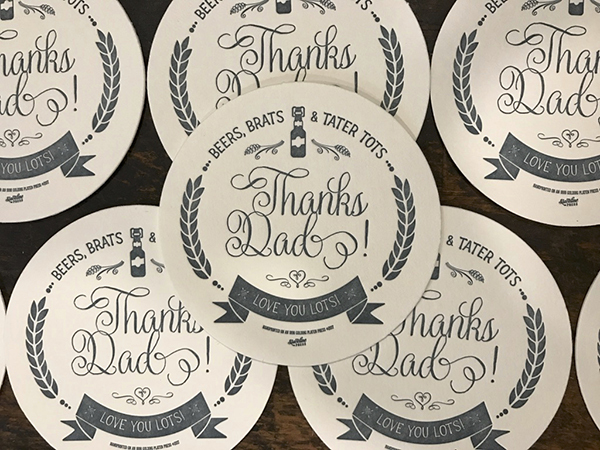 I then send my designs to Boxcar Press to get plates made and then print in my studio. I love to photograph my travels and surroundings and often times I use that as inspiration or reference vs having to go online and look for visuals. PRINTING FEATS I’d say my biggest accomplishment so far is just getting a dedicated space built to house my presses and that I can work in through the seasons. Having it separate from the house but still easily accessible is really convenient. PRESS HISTORY A Golding Jobber 8×12 platen press that was cooped up in a tiny stone cottage in the mountains of Vermont and unused for 7 years. BOXCAR’S ROLE First and foremost, Boxcar customer service is the best! They helped guide me when I got started, and are very quick to get on the phone when there’s something wrong with my order or if I have questions. A moment that stands out to me when Boxcar went above and beyond happened when I was having an inking problem. They worked with me for hours (some of which were after business hours) to help me solve my issue. Boxcar has a quick turnaround, convenient real-time uploading and proofing, and fast shipping. Overall, it’s been an affordable way for a small press like me to get started. PRINTING TIPS The more I print, the more I realize how inking varies depending on the paper I use. If I design something with larger areas of solid color or want smoother inking, I try to print on smoother paper and tend to over-ink. If I have a design that has more fine lines or has a grungier style to it, I try to print on a more textured paper with less ink to add to the grunginess of the design. Also, the brighter white paper is less forgiving in terms of showing imperfections. WHAT’S NEXT I’m growing my stationery line of greeting cards as well as adding more personalized options like wedding invitations. I would love to attend the National Stationery Show for the first time next year and am learning as much as I can in order to get me there. East Haven, Connecticut hugs the shoreline of Long Island Sound and is home to Lourdes Irizarry of Slackline Press. 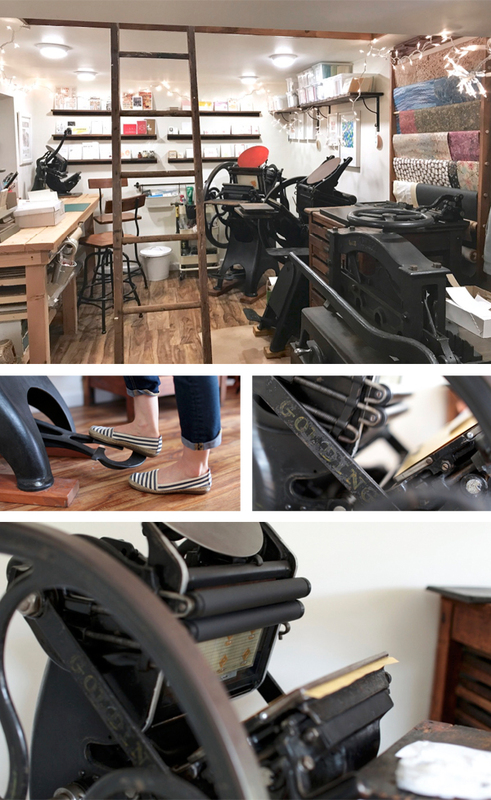 Lourdes’ self-proclaimed printing hideaway has cool tunes playing in the background, a loft nook above the main printing floor, and a treasure of letterpress tools collected over the years. 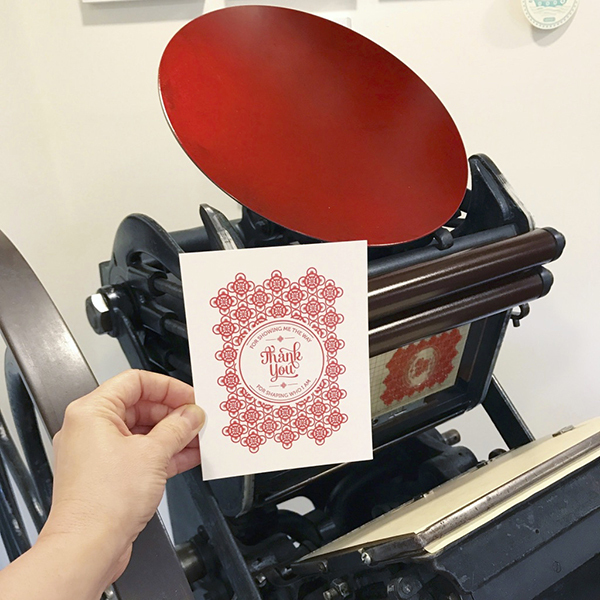 Stepping back from her platen presses, Lourdes gives us a tour of where the printing magic happens, thanks in part to the support she has found in the New England letterpress community. MINIMALIST PRINTSHOP Our shop is small so I like to keep it light and tidy. It has neutral, recessed lighting throughout and natural light from two windows and a sliding barn door that opens to the outside. The floor is a sturdy but affordable, wood textured linoleum over a leveled cement floor that I don’t have to worry about damaging. We built shelving from old wood we salvaged from the renovation, as well as a 7 ft. workbench with storage for large sheets of paper. MOST PRIZED POSSESSION My favorite thing about our shop is a small crawl space in the rafters that was converted into a tiny loft for storage. I outfitted it with an old letterpress tray table I made. It’s a great space to hide with my laptop or sketchbook when I need quiet time to design. My prized possession is my first press – a Golding Jobber #6 named Brumhilda. SHOP SIZE The entire space is approximately 300 sq ft.
CONNECTICUT SPLENDOR Our shop is a half of a detached garage that was drywalled and insulated to be functional throughout the seasons. It’s located behind our tiny cape on the Connecticut shoreline close to New Haven. It’s a short bike ride away from the town beach and town green where the library and farmer’s market is. TYPE OF SHOP Our garage turned studio is in a residential neighborhood, on the border of a commercial part of town. PRESS FAMILY I have 3 platen presses – a Golding Jobber #6 8×12, Golding Pearl #11 7×11 and a Sigwalt Nonpareil 6×9 tabletop press. MOST VALUABLE SHOP TOOL It sounds silly, but I can’t live without my pocket ruler, to help center or square artwork while printing. INK OF CHOICE I print with Van Son rubber-based inks. My favorite is rubine red. It never gets tacky, is easy to mix and looks lovely by itself. SOLVENT OF CHOICE I find mineral spirits work best for me. Easy Street, which was recommended by someone at Boxcar, is a huge help when switching colors, cleaning up dark ink or if ink has been on the rollers for more than a few hours. BASE SYSTEM I’ve had the Standard Boxcar Base for the 5 years I’ve been printing. I started with KF95 plates then switched to 94CHFB but I can’t decide if I like one more than the other. OIL OF CHOICE I use 3-in-1 oil. PREFERRED CLEAN-UP RAG just use old t-shirts that I collect from anyone getting rid of them! PIED TYPE I don’t have a lot of metal type but what I do have came nicely sorted, so I don’t think I have any lying around. KEEPING IT ORGANIZED Clean as you go! Everything in my studio has a home, and if I didn’t put things back in their place I either wouldn’t find them when I need them or I wouldn’t have enough space to work. I think my favorite organizational solution is plastic shoebox size bins to store printed cards. They’re stackable, easy to see what’s inside and keep dust out. SHOP TIPS I feel like I will always be learning. I did notice very early on, how friendly and eager the letterpress community is to share advice. I think acquiring presses that needed some elbow grease and restoration helped to get to know the ins and outs of my presses. They all have their own unique quirks. It takes time and patience but I think it’s a really valuable way to learn.